Please enable java script to see the menuitem!!! Collin and Candy Lin at Unami Sushi Bar. Fans of Japan's artful maki and sashimi have one more reason to visit Ardsley's new Umami Sushi Bar: the seats. Located at 724 Saw Mill River Road, in the Village Green shopping plaza, the Asian fusion restaurant features the most comfortable chairs one is likely to encounter outside of a four-star restaurant. The seats, which feature fine leather upholstery over generous cushions, were custom made. "We want people to feel comfortable when they eat with us," said Candy Lin, who, with her husband, Collin, co-owns the restaurant. The couple opened for business last month in the former location of Sushi Man, which closed more than a year ago. Collin Lin is the head chef while his wife manages the door and restaurant floor. In addition to sushi and sashimi, Umami features hot dishes inspired by non-Japanese locales. One signature dish is called Mongolian Triple Feast — chicken, beef, and shrimp in a hoisin-soy sauce ($18). Candy Lin explained that the dishes sometimes feature non-Asian cooking elements, such as olive oil, butter or cream. One of the owners' favorites is honeyglazed prawns ($20), with a low-fat dairy cream and honey sauce, served with walnuts. 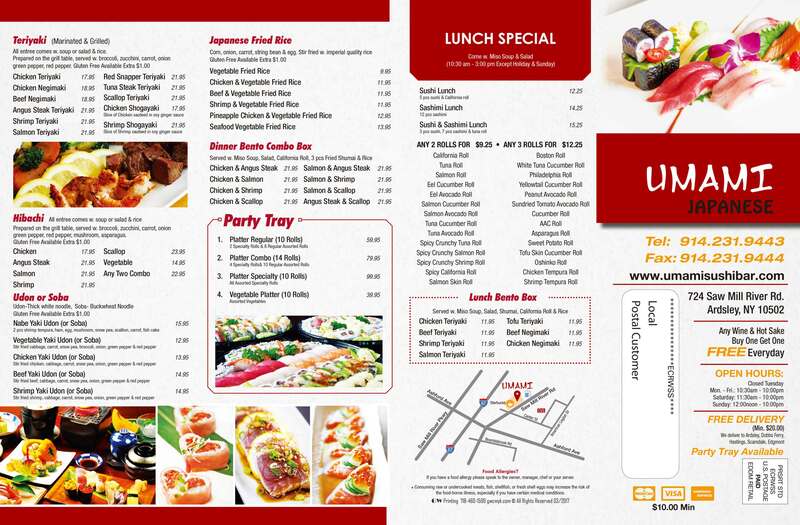 Their lunch special features two ($8.95) or three ($10.95) sushi rolls served with miso soup and a mixed-lettuce salad. "Seafood is the main goal," Candy Lin said. An assortment of signature sushi rolls are on hand, such as the Jaguar Roll, which features no wildcat but instead contains crawfish, avocado, and seared white tuna. The Ardsley Roll features tempura eggplant, tuna, and salmon wrapped in a soybean crepe, which is a slightly sweet, less-papery alternative to the traditional seaweed. The restaurant's name refers to a word with various meanings. To start, the Lins explained, "umami" is Japanese for "delicious" or "delightful." In recent years it has taken on a connotation in the English language, sometimes called "the fifth taste," and is used to describe foods with an earthy salt flavor, like soy sauce or Parmesan cheese. "It is many tastes becoming one," Collin Lin said of umami's elusive quality, "It has a lot of meanings." The suggestion to name the restaurant after the flavor came from a customer at their other restaurant, Fusha Sushi, located in Parsippany, N.J. The couple opened Fusha Sushi about four years ago, and it is now being managed by Collin's brother. Of their decision to open a new place, Candy said, "The first one was successful; we thought, 'Why not open another?'" The Lins, who are in their early 30s, were born and raised in China, outside of Hong Kong, and have lived in the U.S. for 15 years. They married as teenagers before emigrating. Arriving stateside, they both found work in Japanese restaurants, and have been working in the business in New York and New Jersey ever since. They moved to an apartment in Ardsley during the summer. The Lins said there is no relationship between the two entities. "[SushiMan] had a great reputation, of course we would like to continue that," Candy Lin said. The Lins found the location last winter and signed a lease in early spring. Although the space was previously a sushi restaurant, the Lins opted to renovate. A banquette was installed along one of the dining room's walls, and with the cozy chairs the room seats about 50. The couple built a new sushi bar, the façade of which is made of a faux marble that lights up from interior fluorescent bulbs. "We went with a more funky, more modern style," said Candy Lin. 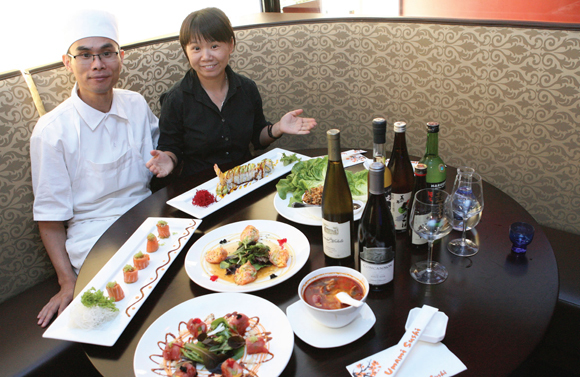 Umami Sushi has a variety of wines and beers, and a sake list with more than 20 selections. Lin said she enjoys pairing sakes and sushi rolls, based on their complementary flavors. The Lins hope to create an atmosphere that will catch on with a discerning public. "We're a smaller business — we need the local people for support," she said. 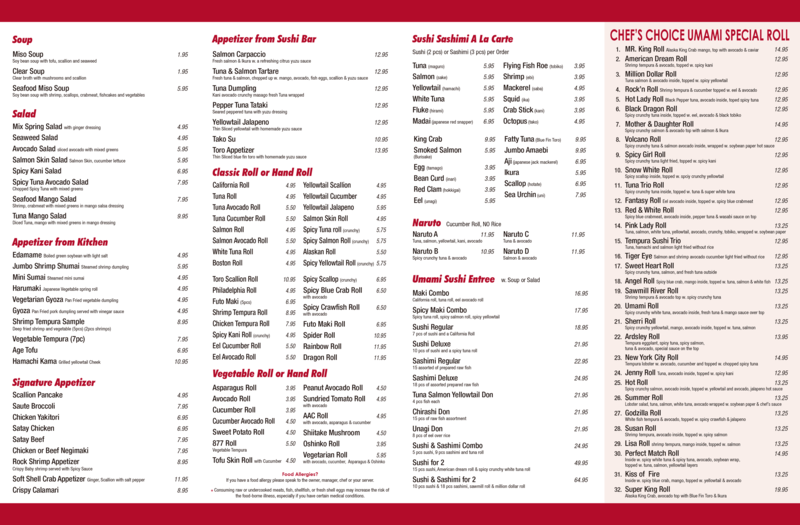 Umami Sushi is open for lunch every day, 10:30 a.m. to 3 p.m. (Sundays starting at 11:30 a.m.). Dinner is served nightly, 4:30 to 10:30 p.m. For take-out orders or reservations, call 231-9444. OR GET THE SECOND ROUND FREE!